This year Harlequin launched Harlequin Teen and their first two releases are paranormal romances: "My Soul to Take" by Rachel Vincent and "Intertwined" by Gena Showalter. Ask and you shall receive, I discovered and Harlequin sent me courtesy copies of both books. They will be releasing a third title "Elphame's Choice" by P.C. Cast September 29th. I've never read anything by Rachel Vincent before and have to say she has earned a new fan. 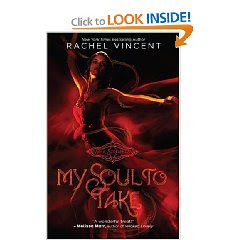 "My Soul to Take" is excellent, with 3 dimensional characters and a story that grips you from the very beginning and keeps you reading. Kaylee can sense death, see shadows around people about to die. The urge to scream is undeniable and she can't speak, can't open her mouth, can't warn them. Otherwise the only thing to come out will be a scream and people will think she's crazy. Nash, the most popular guy in school, suddenly (or so it seems) takes an interest in her and has a way of calming her down. The story is full of surprising twists and turns and that's about all I can tell you without giving away spoilers. This is one of those ya novel that even adults will enjoy. I highly recommend it and look forward to "My Soul To Save" coming out in 2010. "Aside from the death’s, My Soul To Take is refreshingly free of physical violence. The battles fought here are mostly metaphysical but the threat of dying at any time is real and sustains a tremendous level of tension and drama. Friends and family are placed in jeopardy and beyond and several key scenes are heart-stopping." "Thankfully, though this is the first in a series, My Soul To Take is not a cliffhanger. We are simply left knowing that Kaylee is going to learn even more about herself in the next two books. My Soul To Save is the second book and is due out in January 2010 and I can't wait to read it! I'll definitely be checking into Vincent's other books to hold me over until then." That's right - I want to share - it is too good to keep to myself. I'm giving it away to some lucky person who has just been dying to read Rachel's "My Soul to Take" or someone like me that enjoys exploring new authors. To enter this contest, please click here and leave a comment on mytwoblessings blog along with your name and email address. The contest will remain open for the rest of the week and ends at midnight September 18. Winners will be picked using Random.org and notified via email. Contest open to U.S. residents only.